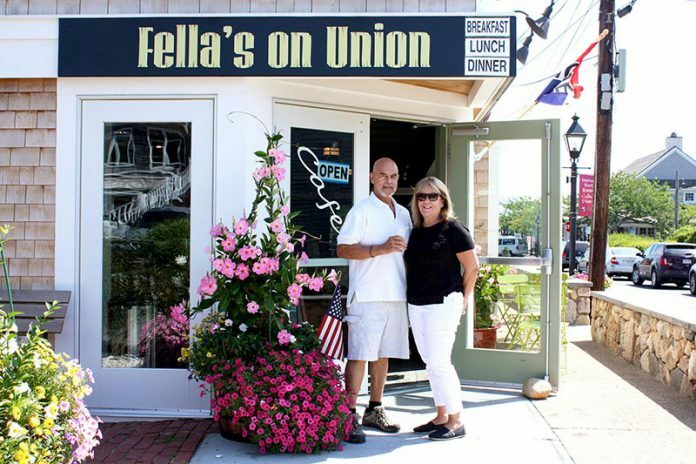 After running a catering business on the Island for 30 years and Fella’s Take Out in West Tisbury for 10 years, Jane and Fella Cecilio opened their newest venture, Fella’s On Union, in late May. Jane: We started our business catering in 1984. That’s how we began. We did that for 30 years on the Island. We did weddings, cocktail parties, clambakes, barbecues. What got you into catering? Fella: I was involved in the food business prior to that, and I was involved in restaurants. When I left the restaurant scene, I went and opened my own business. Jane: When we started our catering business, there were only about three or so other catering businesses on the Island. There was a need for caterers. The intent was to begin with clambakes, but it took off into everything else. And then we opened a store 10 years ago, in December 2005. Fella: Our takeout store in West Tisbury. So what inspired you to open this store? Jane: We were sort of easing out of the catering and we needed something else to make up the difference in the income. 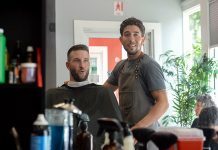 This is more of a cafe, so it’s almost easier to run the two businesses than all the off-premises catering — loading the trucks, unloading the trucks, the long hours. 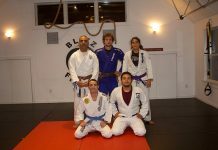 What’s been the hardest part about opening a new business? Jane: Finding the right employees; it’s so seasonal with employees. Fella: Finding people who are experienced in certain things. Jane: And people who are going to stay and not leave in the middle of August. It’s definitely a problem on the Island in the summer — finding qualified help who can find housing, that’s an issue, and who are going to stay with you until September when you’re still really busy. And what’s been the best part? Jane: We designed the building; we created it from scratch really. It’s not like we walked into a building that was done — we spent a year doing this. Fella: We renovated the whole place from the foundation up. A total renovation. We were here for the whole process during that. Jane: It was energizing. It was a new adventure — it sort of awakens you again, you know what I mean? Jane: People love the fish tacos. Fella: And the stuffed burgers. Jane: My favorite is the gelato. Fella: And we have barbecue nights. Jane: Yeah, we do barbecue nights four nights a week. So we have a grill out here in the backyard, an outdoor grill. We do chicken and ribs, coleslaw, cornbread. I think that’s sort of fun. Nobody does that here. What’s the busiest time of day for you? Fella: Mornings are slow here. Jane: Yeah, slow starts in Vineyard Haven. Fella: We’re open from 7 am to 9 pm, but we’re finding that being open at 7, there’s not very much business at that hour in the morning. Jane: Lunch is the busiest. Fella: But if it’s a beach day, the town is dead. Vineyard Haven dies between 2 and 5 if it’s a beach day, versus Oak Bluffs or Edgartown, where you have continuous foot traffic. Do you find that you get ferry traffic up this road? Jane: Yeah, people walk by. We do get a lot of people heading to the boat, grabbing a bite to bring on the boat or having their last meal before they leave the Island, that kind of thing. Jane: Oh, for sure. Like our other store, it’s right next to the post office up-Island. Up-Island is pretty sleepy, but you get all that traffic going to the post office all the time. Fella: People are still finding us. It will take a season to get established here. So what do you hope for the future? Jane: Part of our goal was to get the place up and running and kick back a little bit. We’re going to close this in January, February and March. Fella: But we stay open year-round in West Tisbury. Jane: It’s a whole different clientele there. We’ve got the working guys there, who at 7 in the morning are waiting at the door. Here, 7 to 8 am is really slow. Fella: We’re just feeling things out. We have no idea what the fall season will bring, so we’re just trying to feel things out. Jane: Work hard. You have to be involved in your business. You have to be, you can’t just open a business and let other people run it, you have to be a part of it. Fella: You have to be there every day. You have to oversee it. Jane: It’s 24/7 in a way.